The vascular phase: Immediate temporary closure of a blood vessel by contraction of vascular smooth muscles. The platelet phase: Formation of a platelet plug by platelet adhesion and aggregation . The coagulation phase: For a large blood clot formation by the network of fibrin from fibrinogen. A large number of steps involving many factors are required, some of which require thrombin and Ca++. Each 2 ml ampoule and each tablet contains 250 mg of diethylammonium 1,4 - dihydroxy - benzenesulfonate (INN : etamsylate). As an antihaemorrhagic agent : In surgery : for the prophylaxis and treatment of intraoperative and postoperative oozing in all delicate operations or operations affecting richly vascularised tissue (ENT, ophthalmology, major surgery, cosmetic surgery, gynaecology etc). In medicine : for the control of capillary haemorrhagic whatever the cause or localisation (epistaxic, bleeding in the gastrointestinal or urinary tract, haemorrhage following tooth extraction, ecchymosis, haematomas, purpuras etc). As an angioprotectiye agent : In all cases where the patient must be protected from the possibility of accidents or complications due to reduced capillary resistance or increased capillary fragility, notably in diabetics, patients receiving anticoagulant therapy, hypertensives, arteriosclerotics, pregnant women etc. Premedication before surgery : 1 or 2 ampoules simultaneously (IV. or I.M.) one hour before ,during, or immediately after surgery. Repeat every 4 to 6 hours if necessary. Emergency cases : 1 to 2 ampoules (IN. or I.M. ), repeated 4 hours later if necessary. Angioprotective treatment : 3 to 6 tablets daily taken in 3 doses, for 15 to 20 days a month. Children: half the adult dose. Yes. Dicynone, Ethamsylate, doesnt interfere with the prostacycline synthase so no risk of Thrombosis. 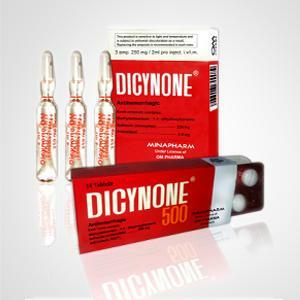 Also DIcynone doesnt interfere with Aspirin and NSAIDS.